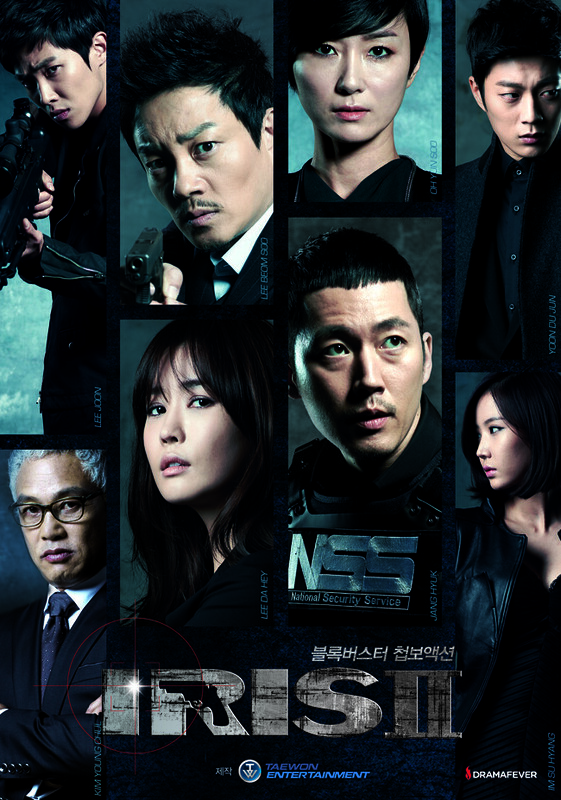 Set 3 years after the death of NIS (National Intelligence Service) agent Kim Hyeon-Jun (Lee Byung-Hun) by terrorist group IRIS. At a warehouse that sells arms illegally, NSS (National Security Service) team leader Joon-Han (Sung Dong-Il) sees Detective Yoo-Gun (Jang Hyuk) and asks him to work with him as an NSS agent. Later, Yoo-Gun is now a team leader for the NSS TF-A team. Soo-Yeon (Lee Da-Hae), who has loved Yoo-Gun since they were young, begins to work as an NSS agent as well. Choi Min (Oh Yeon-Su) is newly appointed as the NSS deputy director. Her only purpose is taken down IRIS. NSS ex-director Baek San (Kim Young-Chul) has been incarcerated at the NSS prison, located on a remote island. A helicopter requests to land on the island and identifies themselves as NSS agents. After landing, they suddenly open fire on NSS agents. They are actually IRIS members. They are led by Ray (David McInnis) and takes Baek San out of prison. But when the helicopter leaves the island, Baek San jumps out of the helicopter and into the ocean. Yoo-Gun, Soo-Yeon and Hyun-Woo (Yoon Doo-Joon) arrive on the island. Soo-Yeon is caught by Baek San, who points a gun at her. Yoo-Gun tries to mediate with Baek San, but Hyun-Woo fires from long range towards Baek San. Soo-Yeon is shot and taken to the hospital. Baek San is moved to an NSS secret house. There, Baek San is interrogated by Yoo-Gun. He wants to know why he turned himself in and why IRIS tried to take him, but Baek San stays silent. Baek San only asks for 3 newspapers to read daily. The NSS team tries to find any secret code hidden within newspapers but find nothing. At this time, IRIS members approach the NSS secret house. A gunfight erupts between IRIS and NSS agents. Yoo-Gun takes Baek San out of the secret house and runs to a car with Baek San. IRIS chases after the car with Baek San. Yoo-Gun is able to get to a military base and they are temporarily safe from IRIS. Yoo-Gun and NSS deputy director Choi begin to suspect that there’s an IRIS mole within the NSS ranks. Baek San finally reveals to the NSS agents that IRIS may launch an attack in Hungary, where high-level meetings between North and South Korea are about to take place. He’s unsure if IRIS is targeting North or South Korea. Meanwhile, Soo-Yeon is now recovered. Even though Yoo-Gun opposes, Soo-Yeon goes to Hungary with the NSS team. Meanwhile, Yeon-Hwa (Lim Soo-Hyang) from IRIS arrives in Hungary and plots out their scheme. There’s also Joong-Won (Lee Beom-Soo), who escaped from North Korea, and appears in Hungary by Yeon-Hwa’s request. After watching IRIS (2009), I decided to watch IRIS II: New Generation. I didn’t really want to watch it at first because Lee Byung-Hun and Kim Tae-Hee didn’t take any part anymore. But since Lee Da-Hae played the main female character, I decided to watch it in the end. I guess my decision to not watch it was actually a good choice. Basically, IRIS 2 isn’t so much different with IRIS, though they put more personal problem here. I do like the background story of Baek San and the main male character, Yoo-Gun. But it lacks romance story between Yoo-Gun and Soo-Yeon. I mean, in IRIS, the romance part isn’t that much either but somehow in IRIS 2 the romance decreases to really minimum. So, the Romance genre is pretty doubtful. As for the conflict, I think it’s different but at the same time not so different from IRIS. It’s easier to predict in some things that are going to happen and that’s why I think IRIS 2 is more boring. I am not surprised that IRIS 2’s ratings are losing from That Winter, the Wind Blows (2013). That Korean drama is too good and too sweet, whereas IRIS 2 is a bit too boring and somehow kind of similar with IRIS. I guess that’s why the rating of IRIS 2 isn’t as good as IRIS too. The story is not something that is new and people tend to prefer something else that’s new rather than watching a similar drama. At least that’s my opinion. So, in a matter of the story, it’s not really new. The same old North and South Korean conflict and still talking about the nuclear bomb. In IRIS, there’s no real nuclear bomb but now, in IRIS 2, there are more than one real nuclear bomb and South Korea still want to join the nuclear nations. The story between the characters is basically the same, except we did learn about Baek San’s past life like I’ve said before. I can’t tell you what’s the same or what’s not because it will spoil everything. I personally don’t like the character of Soo-Yeon. Don’t get me wrong. I like Lee Da-Hae very much since she’s one of my favourite actresses from Korea. She is very good in acting, like really really good. Her confusion and nervousness and panics, it is all seemed very very real. Her limp and sad eyes are just great and real. It’s not an easy task but Lee Da-Hae did it flawlessly. What I don’t like is Soo-Yeon is supposed to be a professional agent but somehow she can’t hide her emotion at all. I know her boyfriend has gone through a dangerous and confusing situation and unknown fate but isn’t she supposed to be a professional? She’s supposed to suppress her emotion and not look so confused and perplexed all the time, even though she’s just a new agent. At least when Kim Tae-Hee’s character, Seung-Hee, couldn’t put her emotion aside, she chose to take a temporary leave. I know it’s a different story and different character but still, I like Seung-Hee way better than Soo-Yeon in a matter of professionalism as an agent. Yeah, I know Seung-Hee has become an agent way longer than Soo-Yeon, but still, I just don’t like it when Soo-Yeon acted unprofessionally as an agent. As for the actress who played the role, I really like both actresses. Kim Tae-Hee and Lee Da-Hae are very beautiful and talented. Both of them are my favourite actresses. I think Lee Da-Hae is really good in playing the character of Soo-Yeon. She really nailed it. No one does better in doing confusion and perplexed state than her, I guess. But I am sorry to say that I don’t like her character at all. As for the male main character, I am not a fan of Jang-Hyuk at all. I know he’s a good actor and played his character really well but I think his character lacks charisma. I don’t know about you, but I felt that way. Perhaps because I’ve seen Lee Byung-Hun’s character, Hyun-Jun, has more charisma and more character than Yoo-Gun (Jang-Hyuk’s character). Lee Byung-Hun really has that charisma and charm that was too great and not easy to beat. Yoo-Gun’s character is too full of confusion and emotional, just like Soo-Yeon. I guess that’s what makes them a good couple. When they are together, Yoo-Gun and Soo-Yeon have good chemistry. You can see how they love each other. Unfortunately, it wasn’t shown much. And again, I am sorry but I have to say that Hyun-Jun and Seung-Hee have a better chemistry together. You can feel the love between the two of them. A good chemistry is a thing that you can not just see but feel too. I even prefer Yoon Doo-Joon’s character, Seo Hyeon-Woo than Yoo-Gun. I just don’t get Yoo-Gun. Somehow I feel he lacks charisma. Well, that’s my personal opinion. You may agree to disagree. As for the setting, IRIS 2 is different from IRIS. The technology is more advanced of course. Now they also added Cambodia into the list of shooting locations. They still shot in Japan and Hungary too. It’s massive, I have to admit. Although IRIS gave more impact than IRIS 2, I think IRIS 2 has made a good choice in terms of shooting locations. All in all, IRIS II is good at some points but I don’t think I like it very much. I prefer IRIS after all. I know Jang-Hyuk is a good actor, but I mean, seriously, Lee Byung-Hun is just too great to be beaten. In terms of charisma, Lee Byung-Hun really has beaten Jang-Hyuk. Since mainly the story of IRIS 2 wasn’t changed much from IRIS, it makes this Korean drama doesn’t give a big impact like before. I give IRIS 2 6.5 out of 10 stars. At first, I was going to give it 6 stars, but since I like how good Lee Da-Hae’s acting is, I decided to give it 6.5 stars.